Chemtech International has one of the most advanced PLC Based Chemical manufacturing facility in Pakistan. The production facility has been designed with a view to ensure that the highest quality standards in chemicals manufacturing are met at all times. 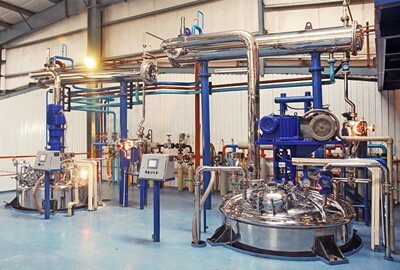 This is truly one of a kind unit in Pakistan, where the whole sequence of production is controlled with a PLC systems. Starting from dosing of chemicals to temperature, pH, heating, cooling and RPM control everything is integrated and monitored using the most advanced data logging and monitoring system. The plant is equipped with 6 vessels. It also has a flaking plant facility in house. In addition to the above two high speed dispersers are also in place to make all sort of Silicone micro macro dispersions/emulsions. Along with flaking, we also have an integrated softener beading assembly which makes us the first textile chemicals company of Pakistan to produce softener beads for textiles.